Do not give or share your password. Please note the difference between a Parent account and a student account. Do not share your parent account information with your child. Close the browser when you are done. If you wish to continue to use the Internet, open a new browser window. Do not chose a password that is easily guessed by someone else such as a spouse's, child’s, grandchild’s, or pet’s name, birthdate, anniversary date, address, social security number, etc. 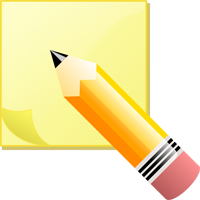 Suggestions on passwords include combinations of letters and numbers or capitals and lower case letters. Please make sure you have read and fully understand the terms, conditions, and responsibilities. The Verification Pass Code (VPC) this is a unique number for each student. The student's permanent ID number (ID). You will also have to enter the student’s home phone number, one that is on record for the student. The entry of these three pieces of information must be completed for each student. Adding additional students may be done at a later date if desired. Where does the Verification Pass Code (VPC) and Permanent ID number (ID) come from? The Verification Pass Code is a unique identifier for each student. This code is only accessible through a letter generated from the student's school office. With the required student information, you are now ready to set up a parent or student account. Below are the steps to create an account. 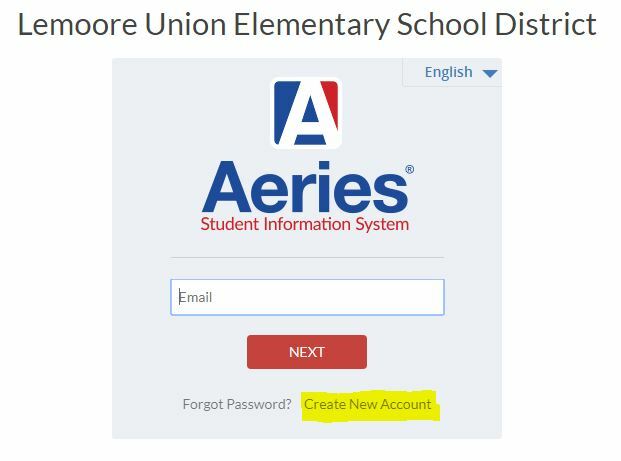 Click on "Login to Aeries Parent Portal” and click on “Create New Account” at the bottom right of the login screen. Type in your Email Address and Password. This will be used to login to the Aeries Parent Portal. Click “Next” and wait for the verification email to be sent to the email address you provided. NOTE: Make sure you have access to the verification email. The email addresses and passwords must match exactly. Open a new browser and check your email to verify your account. You may also use your cellphone to check and verify your email. 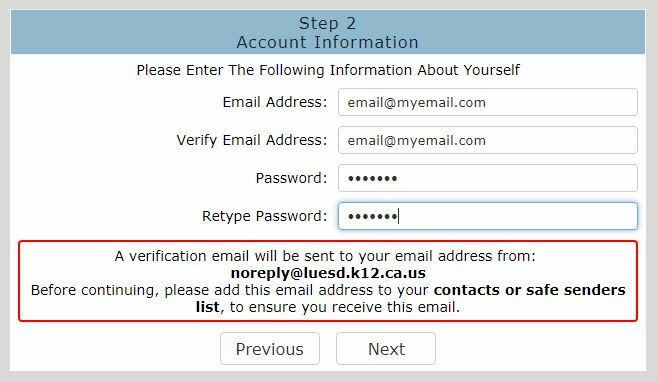 You will receive an email from noreply@luesd.k12.ca.us. 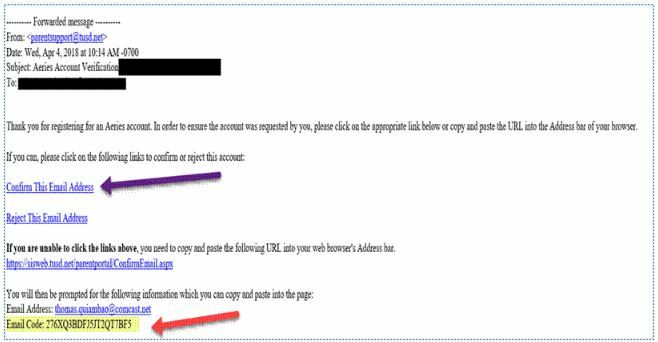 Please click “ Confirm This Email Address” or type the Email Code in Step 3. After you verify your email address, you will receive a confirmation notice. Your account has now been created. Please return to the login page. Enter your child’s Permanent ID Number, home telephone number and Verification Code that you received from the school and then click on the “Next”. Click your name. If you are not one of the contacts listed, click “ None of the above”. Click “Next” to finish the registration process. You may now go back to the “ Aeries Parent Portal” and login using the email address and password. 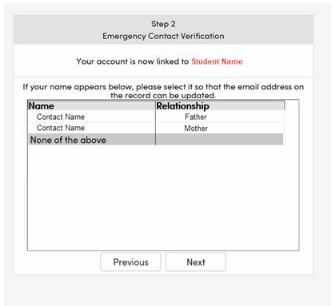 Once you have created an account, you can add additional students to your account. Log into your Aeries Parent/Student Portal account and click on your email address in the upper right hand corner and click on "Add New Student To Your Account". Enter the unique information for your additional student(s). Copyright © Liberty Middle School 2019. All rights reserved.